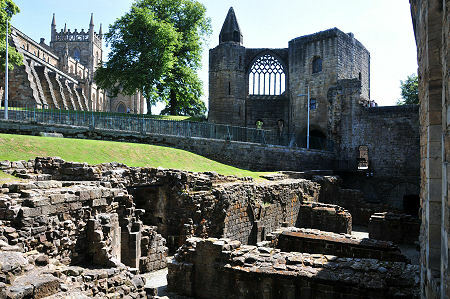 Dunfermline Abbey can trace its roots back to 1070. That was when King Malcolm III married Queen Margaret in a ceremony in a church at Dunfermline. She liked the place so much she decided to set up a religious community here, bringing in Benedictine monks from Canterbury to form its core. This first priory at Dunfermline centred on a church, probably built by extending the existing church in which Margaret and Malcolm had been married. The community remained a modest one in Margaret's time and it was her son, David I, who turned it into an abbey in the years following 1128. The heart of David's Abbey was the Abbey Church. The remains of the original nave built from 1128 still stand, and together with the Abbey Church built in 1821 are covered on our Dunfermline Abbey Church page. On the remainder of this page we focus on the rest of the Abbey, and the Royal Palace it briefly later became. The Abbey Church was accompanied by ranges of buildings around an enclosed square cloister, on the south side of the nave. 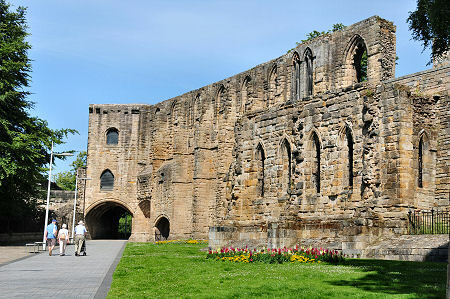 The abbey's domestic buildings were destroyed by the English troops of Edward I in 1303 during the Wars of Independence. It is interesting that the English, who were much less squeamish in their treatment of the Border Abbeys at around the same time, did not touch the Abbey Church. Perhaps respect for the memory of St Margaret and for her strong links with the Benedictine Order in Canterbury and with Rome gave even Edward I some uncharacteristic scruples. Rebuilding got under way almost immediately and continued for many years. 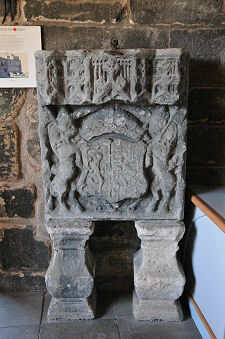 Considerable support was given by Robert the Bruce, who in 1329 was buried at Dunfermline, minus his heart. Development of the Abbey continued for another 250 years. But in 1560 the Reformation got fully under way in Scotland and mobs sacked the Abbey, bringing to an end a religious community not quite 500 years old. The buildings of the Abbey quickly fell into disrepair, though efforts to reclaim the nave of the Abbey Church as a parish church began in the 1570s. In 1587 James VI took control of the remaining assets of the Abbey, and in 1589 he granted the Abbey buildings to his wife, Queen Anne, Anne of Denmark. Anne ordered William Schaw to undertake extensive works on the nave of the Abbey Church, including the rebuilding of the north west tower. But his main contribution was, in effect, a rebuild of the existing Abbey Guest House to the south west of the gatehouse as a Royal Palace intended to be Anne's main residence. Repairs to the palace at Dunfermline were undertaken in advance of a visit by Charles I in 1633 and it was last used, by Charles II, in 1651. But in truth the need for the palace had arisen more because of the poor state of the marriage between James VI and Anne of Denmark who, despite having seven children, spent much of their time living apart. The ruined east end of the Abbey Church was replaced in 1821 with the new Abbey Church. 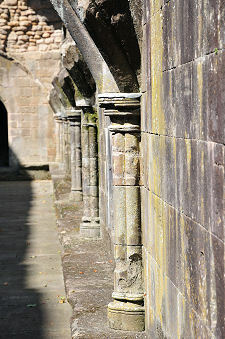 And little remains of the east and west ranges of the cloister. But visitors today can see a surprising amount of the old south range of the cloister, plus what is almost the complete surviving south wall of the remodelled Palace. This occupies a spectacular location above the steep north side of Pittencrieff Glen, now part of Pittencrieff Park. The Historic Environment Scotland visitor centre, complete with its two small museums, occupies the upper part of the old gatehouse of the abbey. 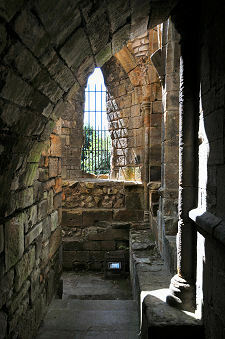 From it you descend an exceedingly tight spiral stair to the kitchens attached to Dunfermline Palace. Only the south wall of the palace now stands anything like complete, but the undercrofts below the kitchens are well worth exploring. To the north east of the visitor centre is the almost complete basement level of the huge refectory which served Dunfermline Abbey. 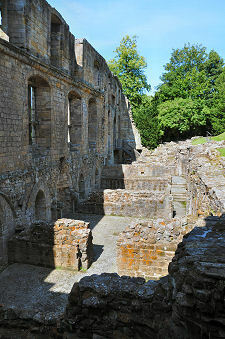 From here it is possible to access the basement level of other parts of the old south range of the abbey. 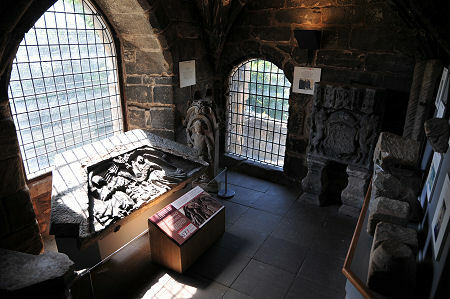 It is worth noting that the admission charge to the Abbey and Palace also includes access to the Old Abbey Church. 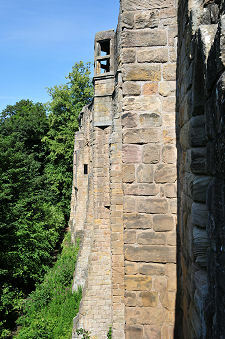 Access to the New Abbey Church, the eastern half of the building, is arranged separately.